Phil Esposito is a member of the Hockey Hall of Fame, he played 18 seasons in the National Hockey League for the Chicago Black Hawks, Boston Bruins and New York Rangers. He is considered one of the best to have ever played in the NHL, and is the older brother of fellow Hall-of-Famer Tony Esposito, a goaltender. Esposito also played for Team Canada in the inaugural Canada Cup in 1976, on a line with Hall of Famers Bobby Hull and Marcel Dionne. The following year, he would represent Canada once more in the 1977 World Championships. 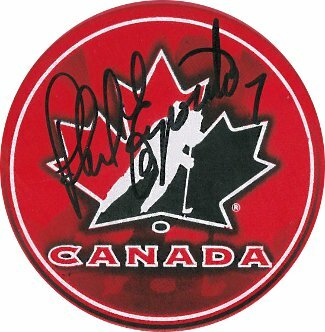 Phil Esposito has hand signed this Team Canada Hockey Puck. MAB Hologram and Certificate of Authenticity from Athlon Sports.